Ben Carson, Keith Ablow, Fox News – Please Shut Up! On April 1, 1933, the Nazi party called for a boycott of all Jewish owned businesses in Germany. 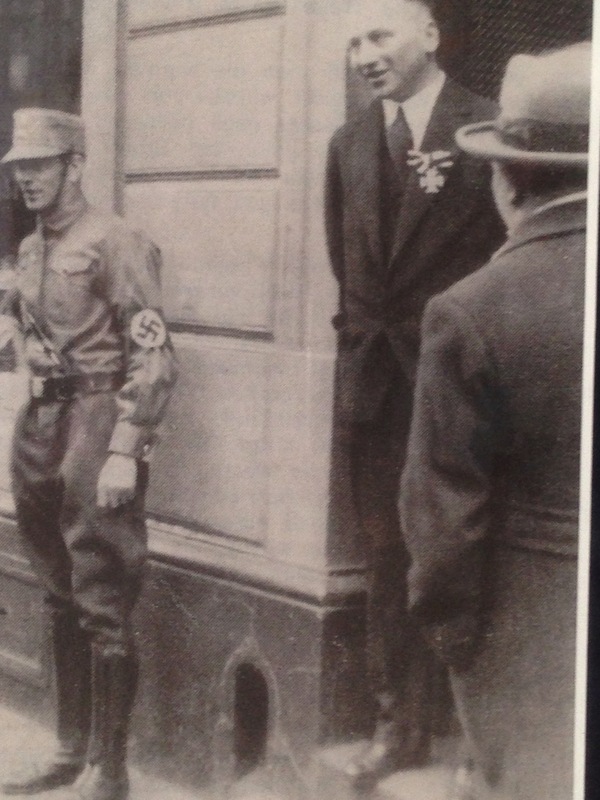 Richard Stern, a Jew, as well as a decorated German veteran from World War I, stood in the doorway of his bedding store, wearing his Iron Cross, and passing out leaflets he had printed condemning the actions of the ruling Nazi party. He was arrested. Fortunately he had friends at the police headquarters who had him released. Richard Stern was my father’s uncle, but in reality his father – his mother’s brother and the man who raised him as his parents were divorced. For all intents and purposes, Richard Stern was my grandfather, a genuine hero who although passing in 1967, inspires me to this very day. Like most German Jews Richard Stern could not believe that the country in which Jews had lived, prospered and assimilated, would actually become crazy enough to carry out the radical ideas expressed by Hitler and the Nazi party. He had faith in the democratic system of Germany. The Jewish success story in Germany was exceeded only by the Jewish success story in America. He was active in the Social Democratic party, a mainstream party. He had faith that his friends and neighbors, with whom he fought alongside in World War I, would reject the crazy ideology that would eventually lead to the slaughter of 6 million Jews and another 6 million people who the Nazis deemed unfit to live. The rise of the Nazis began through the German electoral system. They reached the peak of their electoral success in July 1932 when they won 37% of the vote. But Hitler refused to form a governing coalition with any other German political party. So the President of Germany, Paul von Hindenberg, appointed Franz von Papen as chancellor. As Papen could not govern without sufficient support in the Reichstag, a new election was called for November 1932. Support for the Nazi party actually decreased to 33%. Nevertheless, Hitler convinced Hindenberg to appoint him as chancellor. The result was devastating. Hitler engineered new elections called for March 5, 1933. With Hitler as the head of the government, the Nazi storm troopers had free reign to attack and oppress their political opposition. Just 6 days before the election, the German parliamentary building, the Reichstag, was burned down. Hitler used that to gain special dictatorial powers and further suppressed the voting support of opposition parties. Yet the Nazis still did not win a majority, polling 44 % in the March 5, 1933 elections. In addition, the initial action against the Jews; the boycott of Jewish businesses, was not very successful. Germans still bought from their Jewish friends and neighbors. No, the real oppression came after a steady campaign by the Nazis to demonize anyone who disagreed with the Fuhrer, who opposed the Nazi party in any way. Indeed, another relative of mine, Emil Romberg of Essen, Germany, was a leader of the Social Democratic party and was beaten to death by the Nazis. So by November 1933 it was no surprise that the Nazis won every seat in those Reichstag elections. The reign of terror had truly begun. In September 1935 the Nuremberg laws were passed, institutionalizing a vast array of anti Jewish practices. The Jewish community was stunned. Some realized the need to leave Germany. My mother’s family was able to immigrate to America in 1936. My father, his mother, and Uncle Richard wanted to go to Palestine, but could not gain permission to enter. Most German Jews, however, still clung to the belief that the craziness of the Nazis was a passing phase. Most could not understand how their homeland, the country they loved and to which they dedicated their loyalty, could see them as criminals, as undesirables. We can, however, learn how this happened. Just visit the museum, “A Topography of Terror” in Berlin. It gives in full detail, with unvarnished honesty, how the Nazis succeeded at convincing a populace to follow the Nazis. Hitler promised to restore the “real Germany,” the one of power and status. He promised to rid Germany of unwanted alien elements. He spoke of true German values and staged massive, extremely effective demonstrations to demonstrate his popularity. He condemned all opposition as disloyal, not truly “German.” By the time of Krystalnacht in 1938, it was a country gone insane. By the way, in this analysis of the success of the Nazi rise to power, guns are not mentioned at all. The ownership of guns, you see, is pretty much an afterthought in understanding the success of the Nazis in 1930’s Germany. There can be little effective resistance to the brainwashing effects of propaganda when the value of “patriotism” is used to silence political opposition and the shut down the free press. The Nazis did not prevent opposition because they had more guns, but because they controlled the dissemination of information. They controlled the media of the day. Does any of this sound a bit familiar? I would argue that the ideas being perpetrated by the hard right, the xenophobia about Mexicans and Muslims, the chest thumping patriotism, are far more likely to lead us down the road to Nazism than any proposed or even yet to be proposed gun law. And I say that as someone who is not against responsible citizens owning guns. Talking about the Holocaust in terms of gun issues is a gross distortion of history. Even worse, it dishonors the memories of those who suffered that tragedy, through the implication that somehow the victims were to blame, that somehow they could have done more than try to survive the confusing times in which they found themselves; that they could and should have been examples of 21st century radical right wing ideology instead of just innocent German Jewish citizens. And, it dishonors the memory of those Jews, who, like my Uncle Richard Stern, did stand up and protest. Enough of the idiotic comparisons that tramples on the dignity of the victims. Enough of rewriting history to suit your political agenda. So to you, Ben Carson, Keith Ablow and Fox News – just shut up. You can almost hear the sarcasm in Rabbi Gamaliel’s voice. He clearly thinks that Akiba is a fool for attempting to build a sukkah on the deck of the ship. So I ask you, based on this story, do you think Akiba’s sukkah was valid or invalid? Well, halachah follows Rabbi Akiba. It also follows him regarding the building of a sukkah on the top of wagon, the top of a tree, or the back of a camel! I am sure that some or all of these strike you as rather silly. So we can ask the question, why are these sukkot valid? (note that the Sukkah on the back of the camel can only be used during chol mo’ed) In fact, why are these examples even considered at all? The fact that they are discussed in the Talmud shows that these situations did arise. I must admit I am trying to figure out how to build a sukkah on the back of a camel. However, I think the Talmud is pushing us to think differently about a sukkah. Indeed, I would suggest that we are the sukkah. I believe the sukkah symbolizes our physical bodies. Consider this. The sukkah is not supposed to be a permanent structure. This is evident from a number of restrictions on how it is built. First, it cannot be higher than 20 cubits. Why is this significant? A cubit is the length between the tip of your middle finger and the corner of your elbow. Clearly this is different for each of us. So the upper limit to the height of our sukkah depends on a body measurement singular to each of us. Even more, the taller the sukkah, the more permanent the structure has to be constructed. A sukkah built on top of another one is invalid as well and you can guess a reason – that such a structure implies more permanence than intended. The sukkah should be able to withstand a modest amount of wind, but not built to withstand exceptional winds. Planks can be used for the roof, but not wider than 4 handbreadths (another measurement that is individualized as opposed to standardized). One has to use branches, stalks or stems from plants grown from the ground for the s’chach (roof covering). All of this just reinforces that the sukkah is a very temporary, fragile structure – just like our bodies. A sukkah is open to the elements. It is subject to the wind and rain. Its roof is supposed to have enough opening that one can see the stars. So it is with our bodies. They are susceptible to the exigencies of the weather, to the whims of nature. However, we live mostly indoors, wear protective clothing and take measures to protect our health. The command to eat and sleep in the sukkah is meant to remind us how exposed we really are, especially when we are not in the comfort of our homes. By simply eating a meal in the sukkah, we become aware of the elements – heat, cold, rain, sun, bugs – in a way different from our everyday lives. Just as the sukkah is open to the world, flimsy walls on 3 sides with one side open, as well as a roof patchy enough to see the stars, so are we supposed to be open to the world. This is highlighted by the practice of ushpizin, the welcoming of guests, preferably strangers, and at least one poor person, into our sukkah. The openness of the sukkah and the welcoming of guests have layers of potential meaning. The pshat or plain meaning is the clear exposure to the elements. Looking a little deeper, are we open enough, willing to share ourselves enough to welcome guests? Or do we shut ourselves off from others? Finally, are we willing to look up and potentially see stars? I view this as a reminder to look beyond our own ideological comfort zone, to open our minds to other ideas and perspectives. The sukkah reminds us that if we are open, things will pass through us easier, we will absorb the winds of change and difficulty better than if we are rigid. It is taught in Proverbs 20:27, “the soul of a person is the light of God.” God is that eternal light that drives us to bring blessing and righteousness to the world. Our bodies are the physical agent that houses and protects that light. Or, to put it another way, in each of our physical existences is a Divine Presence; that piece of us breathed into us by God – our souls. Yet our bodies are also susceptible to those things that threaten to extinguish the light of God. Our bodies can also be compared to the mishkan, the portable sanctuary the Israelites carried through the wilderness in which God’s presence dwells. Just as the mishkan was guarded against impurity, so, too, are we instructed to keep our bodies free from impurity. What is impurity? According to the theology we learn from Leviticus, and carried throughout rabbinic times, impurity is anything that repels the presence of God. Impurity can be an act gone wrong or a substance that dims the light of God. When we are participants in a moral wrong the light of our soul dims. When we are exposed to disease, the light of our soul dims. For whatever afflicts the body afflicts the soul while the soul inhabits the body. The sukkah symbolically reflects this same concern. The Mishnah teaches that whatever is subject to ritual impurity and does not grow from the soil is not allowed to be used in the building of the sukkah (Sukkah 11a). We – who carry the light of God, cannot dwell in a place, even a temporary place, which contains the impure; just as the light of God cannot dwell in a body that is kept impure, physically or morally. Further, just as the mishkan of our ancestors carried God’s presence through the wilderness, each of us spends most of our time wandering in a wilderness. How much of the time are we truly sure of the path we are travelling? How much of the time are we sure of our moral direction? How much of the time are we sure of our professional direction, our careers? How much of time are we sure of our spiritual direction. While some aspects of our lives seem in order at any given moment, how often do we feel in the wilderness in a different aspect of our life? Just as God asked Adam, the first man, ayekah, where are you, God asks us that question quite often. How many times do we know? That is why a sukkah built on a ship, a wagon or a camel can be valid. We, our physical bodies, are sukkot wandering in the wilderness, not knowing how the jolts of the journey will affect us. When Rabbi Gamaliel asks Akiba, “Where is your sukkah,” perhaps it is an echo of God’s question to Adam. The Talmud does not tell us what Akiba answered. I would like to believe that Akiba answered that the fact his sukkah was blown away is exactly what made it valid. We can never know where we will be or where the winds might blow us. Our sukkot should reflect these values taught by Kohelet. They should be decorated in a way that reflects happiness and enjoyment, with the realization that these, like our own lives, are temporary. We might not know the answers to life’s ultimate questions, but we can show appreciation for the moment in which we exist. We can choose to enjoy that moment. We can choose to do what is good and right. Life simply is, and we can choose to fight it, or to embrace it. The sukkah built on the ship is valid because each one of us is a sukkah balanced precariously on a ship sailing through the sea of existence. We control very little of that journey, but we can rejoice in having the opportunity to even make the journey. As much as anything, Sukkot is about rejoicing. May this Sukkot bring us a sense of joy, wholeness, and contentment.